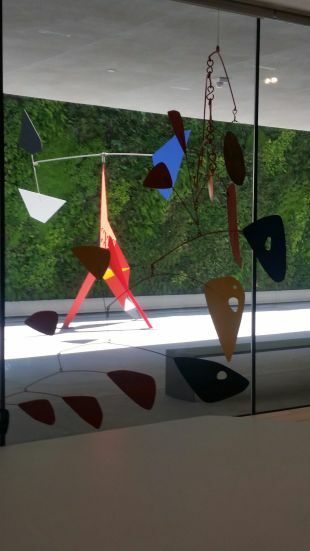 Calder, inside and out with Vertical Landscape. The San Francisco Museum of Modern Art has always been on my list of must see places each time I visit the city. When I learned it would be closed for renovation I could not have imagined the scope of its new home which recently reopened. I returned to the museum at the end of April to explore this expanded, beautifully designed museum for modern art, the largest of its kind in the country, and it was well worth the wait. The stunning entrance to the museum features high ceilings, expansive staircases and Calder. Most important is the expanded collection which has opened with 19 special exhibitions including a curated selection of 260 postwar and contemporary works from the distinguished Doris and Donald Fisher Collection featuring those by Matisse, Mark Rothko, Frida Kahlo, Alexander Calder, Ellsworth Kelly and Jeff Koons and many more prominent artists. Also featured are more than 600 works promised through the museum’s Campaign for Art, cherished favorites from SFMOMA’s permanent collection as well as works specially commissioned for the new museum. The new Pritzker Center for Photography offers the largest exhibition, interpretation and study space dedicated to photography in any art museum in the country. Do not miss the living wall, a beautiful vertical outdoor landscape, providing a luscious backdrop for the sculpture garden. So many wonderful works of art beautifully displayed throughout the museum’s many unique galleries. Upcoming: New Work: Sohei Nishino, Palul Klee at Play, A Slow Succession with Many Interruptions: Art of the 21st Century, Matisse/Diegbenkorn and Edvard Munch: Between the Clock and the Bed among many other featured exhibitions to look forward to viewing. The museum reopened to the public in May, offering visitors a beautifully designed, by the Snohetta architectural firm, triple the size museum exhibiting modern art, photography and more. The thoughtful design features several places to dine, gather or relax. In Situ, a restaurant by Michelin three-starred chef Corey Lee, features famous dishes from around the world is scheduled to open in June. Delightful casual dining is offered inside or on the terrace in Cafe 5 for light, casual California fusion fare. And a first class coffee bar, Sightglass, includes comfortable tables and chairs for guests to catch up on their computers with free WIFI or relax and chat in a welcoming atmosphere while sipping their beverages and enjoying a delicious pastry. A word about restrooms….wow…look out for those intense colors…the perfect surprise for this museum full of surprises. SFMOMA is open to the public seven days a week and admission is free for visitors 18 and younger.